Savour the ultimate luxury of this lodge with vista views over endless horizons that will leave you breathless in the Sabi Sands Game Reserve. 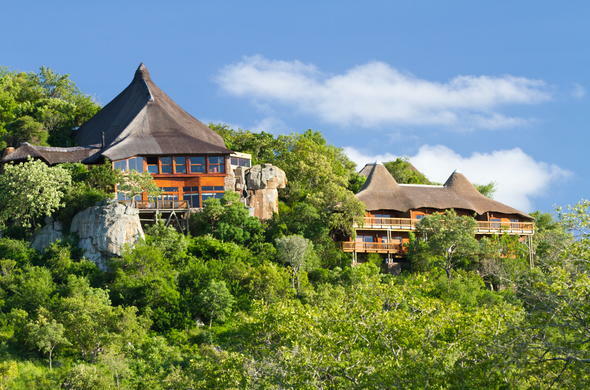 See an Endless Horizons Safari Package based on this lodge. What sets this Sabi Sands Safari Lodge apart? The lodge has one of the best views in the area and is an ideal romantic retreat for couples or a laid-back family holiday. Situated high on a koppie (hill), this safari lodge has fantastic views over Sir Richard Branson's Private Game Reserve allowing you to experience the drama of the African plains. Each of the sumptuous rooms has stunning views and is decorated with a different tribal theme. This child-friendly safari lodge welcomes the whole family, and children can delight in the range of activities offered by the Ulusaba Cub's Club. Meanwhile, adults can enjoy an optional aromatherapy massage at the spa, or enjoy a game of tennis. You can enjoy exciting morning game drives, or learn about the African bush while on bush walks accompanied by a knowledgeable guide. You can also discover the beauty of the African night while star gazing in the bush observatory. Enquire about the amazing kids specials at Ulusaba. Children between 0 - 11 years old can stay at Ulusaba for free when sharing with at least 1 adult. There are also fantastic programmes for the little ones at the Cub's club.